Now, it’s very difficult to make conclusions based on these findings. It could be that the liberal blogosphere is experiencing a Long Tail effect, meaning that readers of liberal blogs are spreading out over a larger range of websites. And though liberal blogs showed a sharp decline in web visits during 2007, this isn’t to say that their overall visits didn’t increase compared to 2006 — it’s hard to say, since Site Meter only tracks the previous 13 months. 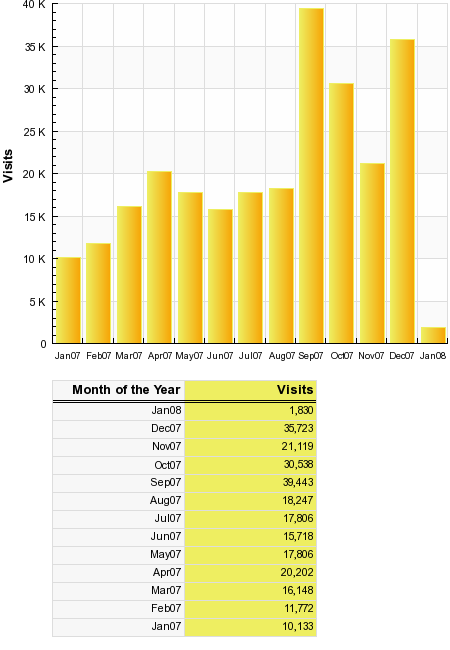 The graph above, like those at Blogasm, shows number of visits (not page loads) per month). While small compared to the blogs reviewed at Blogasm, readership at Liberal Values has been increasing in contrast to the liberal blogs evaluated. I’ve attributed this to being a newer, smaller blog which is gradually building an audience. Maybe overall readership at liberal blogs is down because liberals see more victories in the real world and have less need to spend as much time at blogs as when Republicans controlled everything. I’m now wondering if there isn’t something to the long tail effect. Many of my links come from small blogs and I wonder, with the larger liberal blogs becoming somewhat of an echo chamber repeating the same stories and views, if there isn’t increasing interest in us smaller blogs which often do cover different material. It would be interesting to see if there is an overall increase in a liberal blogosphere beyond the largest and most well known A list blogs. More liberal readers might be finding a niche which comes closer to their views or interests. Justin Gardner also gives his views on this topic. While I’m not sure if the the long tail explains this, I don’t agree his dismissal of the idea by asking “who’s going to trade more news for less?” Several times I’ve reported on items which the bigger blogs didn’t discover until days later, and I’m sure this is true among other smaller blogs. Monitoring a selection of small blogs might be a better source of information than only reading the big blogs. This is especially true the more the big blogs concentrate on the top headline material for which there are many other sources of information. Another factor which might throw off these calculations is the effect of RSS readers. While some weeks my readership might be up or down based upon direct hits, the number of subscribers to the RSS feeds has consistently gone up by about one hundred new subscribers every week, and the number of subscribers to the RSS feed is several times the number of visitors. Perhaps the decrease in circulation among liberal blogs is only a consequence of more people subscribing to RSS feeds. This would need to be evaluated before really comparing liberal and conservative blogs if for some reason hits on liberal blogs are simply being affected more by RSS readers than conservative blogs. The Blogosphere vs. Barack Obama, Or Who Wanted To Win Anyways? Some will argue that the netroots are outside the mainstream, even outside the mainstream of the Democratic Party’s base. But this latest tension, coming on the heels of Obama’s attacks on independent expenditure groups funded by such Democratic base stalwarts as unions, raises questions about whether or not Obama is seeking to run as someone independent of the Democrat’s traditional constituency and interest groups altogether — and whether he’s going to have to, no matter what. It is not as if Obama’s support is entirely out of the mainstream base. Smith’s assessment is more likely as Obama expands the Democratic party’s bas as opposed to running totally independently of them. However, some showing some degree of independence from traditional Democratic special interests will also help Obama among independent voters. Ben Smith notes the similarities between some of the attacks on Obama and earlier attacks on “Clintonism.” While analogies can no doubt be made, there are hopefully important differences, which is why Obama polls so much better among voters who are interested in change. I through in “hopefully” because I can’t disagree with those, including those married to Hillary Clinton, who argue that voting for Obama is a gamble. I’m not entirely sure how much Obama is for real and how much he has developed a pose for political benefit. By default Obama appears to be the best alternative of the three who appear to have a chance to win. Besides, even if consideration of other views was started as a political ploy, as long as he is dong so, and this is reflected in his policy positions, this is of value. In Obama I see policies based upon liberal values which also recognize the views of others, as opposed to “Clintonism” which too often turned into compromise on principles for political gain. The Carpetbagger Report questions if Edwards has a problem due to having decided to accept federal matching funds, along with the limitations on spending, and reviews the problems. Steve links to an excellent analysis from Kos, which I’ve also cited in the past, that demonstrates the problems from a fund raising perspective. It is becoming apparent that the problems go beyond this. Edwards’ plans to attempt to circumvent these problems at very least raise further questions as to his integrity as he attacks other Democrats claiming to be holier than anyone else on fund raising. At worse there may be violations of laws regarding coordination between his campaign and 527 groups. I’ve noted some of the questions regarding Edwards’ fund raising in several posts, most recently here. Writing at The Hill’s Pundit Blog, Peter Fenn reviews some of these issues in a post entitled, Edwards: Too Cute by Half. Normally I would just provide an excerpt from a post such as this but in this case it is important to read the entire post. For those who might not follow the link I’ll reprint it under the fold and hope the author would see this exception more as flattery than a violation of intellectual property rights.